The only review of the performance of the “Port Stockton March” comes from the composer, who also was the port’s chief engineer and first manager, Benjamin Casey Allin. Reviews of the symphony performances were not written for The Stockton Daily Evening Record when the piece was performed on Dec. 7, 1936, but contemporary audiences will be able to judge for themselves whether it merits generous applause. Aschieris didn’t have the full orchestra score. That he had the piano sheet music for the march, which essentially is the melody, is almost miraculous. Boxes and boxes of materials — the port’s documented history — are in a warehouse, and one of the interns came across the music in one of those boxes. 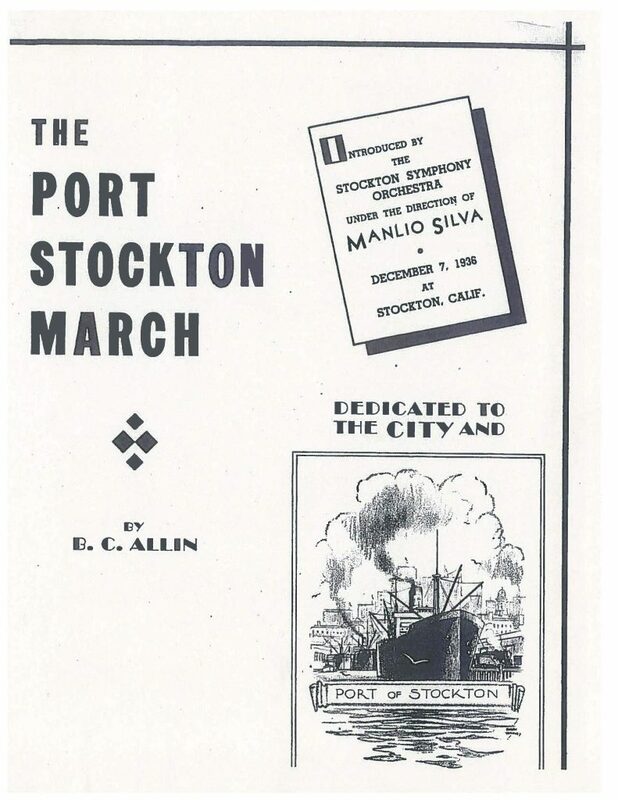 The notes on the cover of the sheet music report the “Port of Stockton March” was then performed on Dec. 7, 1936, by the Stockton Symphony Orchestra, directed by that group’s founding conductor, Manlio Silva. The Stockton Daily Record listed the march in a short story about the symphony’s planned program. Although that 1936 orchestral score didn’t exist, Jaffe created one for the 2018 edition of the symphony. Aschieris, who has invited port employees to attend Saturday’s concert that the Port of Stockton is helping to sponsor, said Jaffe’s interpretation matches Allin’s brief description of it in his autobiography. “He’s talking about an earlier composition of his about his time in India and he says, ‘Another composition of mine, far different in spirit and more of a musical romp than a serious composition, was the ‘Port Stockton March,’ ” Aschieris said. The piece is only a couple minutes long, but Jaffe said it’s a fun surprise for the audience, and Ashieris, for one, is anxious to hear it.